With a name like that, you'd expect to find someone tossing dough around and the smell of pepperoni in the air. Imagine the shock on someone's face when they come in expecting a large Hawaiian and ended up with a large Pho instead? Somehow pepperoni cannot be substituted for rare beef and fatty brisket. 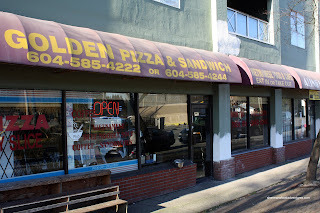 The old store apparently was a pizza shop. However, the new owners turned it into Vietnamese restaurant and did not change the name. What a hoot! Well, at the very least, I knew what I was getting into when I visited it today. In fact, all of the clientele knew exactly what they were doing there since they were all Vietnamese. That's a good sign. I really enjoy restaurants like that since it's an indication of authenticity. The server seemed almost taken aback when I walked in. I don't look anything close to being Vietnamese. She asked if it was my first time visiting the place. Most of the patrons seemed like regulars. She was very nice and even handed me a copy of the Province. I really didn't need it since it interferes with my eating and photo-taking. I ended up getting the Special Pho. Curiously, there is no choice in bowl size. For good measure, I decided to try their Meatball Banh Mi. I just love how food comes out lightning fast at Vietnamese restaurants. Especially in this case since Whalley isn't exactly that close to my work. This way, it leaves more time for me to eat without trying to scoff down a whole meal in order to make it back to work in time. To me, the pho looked almost like home cooking. What I mean by that is the meat appeared to be hand cut and not very uniform in size. I enjoyed the soup, it was flavourful, not too salty and just a small amount of fat. The noodles were cooked all the way through without being soft. 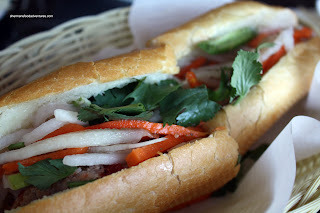 The Meatball Banh Mi was also pretty good. The bread was light and crunchy. The meatball filling was tasty with bits of onion and everything seemed fresh. I only wished that the julienned daikon and carrot had a bit more flavour. Otherwise, pretty good banh mi out here in Surrey. I guess at least this fulfilled the "sandwiches" portion of the restaurant name. I only hope on one calls this place and tries to place an order for a large meat pizza. They will be in for a very big surprise. That´s hilarious! You´d think a name change would be first on the list. Especially when you go from pizza to pho! BTW...you and Kim are killin´ me! 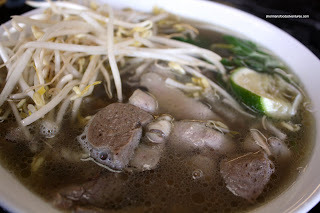 I´m in Mexico suffering from pho withdrawal and BOTH of you do pho posts. Simultaneously! Thanks! I thought it was hilarious too, it's what drew me to it! Yes, I get Pho withdrawal too when I'm on vacation. 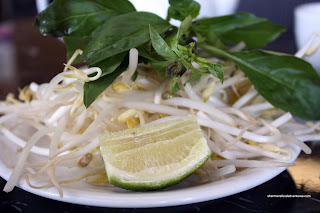 A bowl of pho is waiting for you when you return! "The name has been around for about a decade and that's what people know it as."